Click to view PDF version of this book. 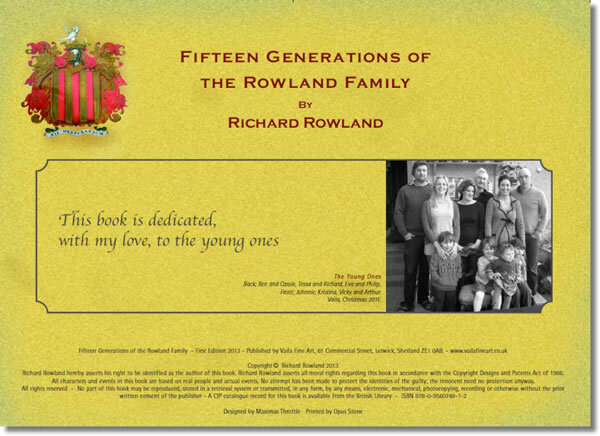 This website contains the text, trees and pictures of the book, Fifteen Generations of the Rowland Family by Richard Rowland published in March 2013 (second edition 2017) by Vaila Fine Art. In addition this website contains over forty trees updated in 2017 of the families covered in the book in addition to the Rowland family, namely Mawles, Cowderys, Pollards, Adcocks, Barbezats, Gibbs, Harbottle Reeds, Foyles and Domvilles. Please leave any comments or queries in the manner provided.